Audiology Australia has negotiated discounted rates at a number of hotels within walking distance of the Alice Springs Convention Centre. These rates are only available to registered Sound Exchange ’19 delegates and must be booked via this registration form. Each hotel’s booking terms are included below (correct at time of publication). Every effort is made to satisfy accommodation requests; however rooms are subject to availability. We strongly encourage you book early to avoid disappointment. You may make changes to accommodation bookings through a link supplied in your Sound Exchange ‘19 registration confirmation email, subject to the terms and conditions for each hotel. Should you have any queries regarding accommodation, please contact the Events Team on events@audiology.asn.au or phone 03 9940 3900. By making an accommodation request, your personal information will be shared with the hotel to organise your booking. Nestled at the foot of the majestic MacDonnell Ranges in Alice Springs, the 4.5-star Crowne Plaza Alice Springs Lasseters offers rooms with a balcony or patio. Guests enjoy free Wi-Fi, a heated pool, a spa bath and a 24-hour health and fitness centre. Crowne Plaza Alice Springs Lasseters is located next to Alice Springs Convention Centre and Alice Springs Golf Course and the Alice Springs Desert Park is 15 minutes' drive away. There is an on-site casino, a sauna and a spa and wellness centre. Other facilities include a concierge service, a tour desk and laundry services. Room includes: King size bed, shower, tea & coffee making facilities, in-room safe, iron, ironing board & hairdryer. Room includes: 2x Queen size beds, shower, tea & coffee making facilities, in-room safe, iron, ironing board & hairdryer. 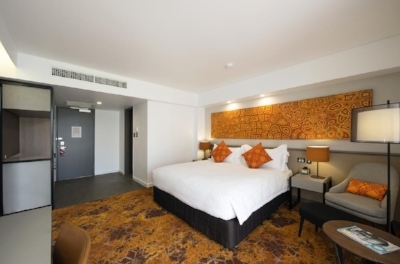 Room includes: King size bed, large walk in shower, aboriginal artwork, media hub, iPod dock, tea & coffee making facilities, in-room safe, iron, ironing board & hairdryer. Room includes: 1x King size bed, large walk in shower, separate lounge and bar area, guest toilet, tea & coffee making facilities, in-room safe, iron, ironing board & hairdryer. Room includes: 2x King size beds, 2 bedrooms with en-suite bathrooms, separate shower and bath, aboriginal artwork, media hub, iPod docks, guest toilet, tea & coffee making facilities, in-room safe, iron, ironing board & hairdryer. Credit card details must be provided at the time of booking and these are held by the hotel as a guarantee. Cancellations within 30 days prior to arrival will be charged one nights’ accommodation fee. Cancellations within 7 days prior to arrival, including no shows, will incur a 100% cancellation fee of the accommodation booked. Between the Todd River and Alice Springs Golf Club, and with the MacDonnell Ranges as a backdrop, DoubleTree by Hilton Alice Springs is a luxury resort awarded for its environmentally friendly innovations. A signature, warm DoubleTree chocolate chip cookie is provided when you check in. The air-conditioned rooms have balconies that overlook either the mountains or the hotel's heated swimming pool or the hotel's gardens. All spacious guest rooms and suites offer generous work surfaces, luxurious bedding and access to free Wi-Fi in public areas. Room includes: Double size bed, air conditioning, balcony, ergonomic desk chair, LCD flat panel TV, non-smoking, hairdryer, internet access, iron, ironing board, mini bar and rubber shower mats. Cancellations within 30 days prior to arrival, including no shows, will incur a 100% cancellation fee of the accommodation booked. Alice in the Territory is nestled against the magnificent East MacDonnell Ranges. Experience the rugged beauty of the Australian outback while close to shopping and sightseeing. Located 3.7 kilometres from Alice Springs town centre, Alice in the Territory hotel is adjacent to the Convention Centre, Casino and one of the world's best desert golf courses. Relax by our resort style swimming pool with magnificent views of the East MacDonnell Ranges and enjoy a BBQ with the family after your swim. Room includes: Queen size bed, shower, bath, airconditioning, hairdryer, iron, radio, fridge, ironing facilities, flat-screen TV, sofa, eletric kettle. Room includes: 2x queen size bed, shower, bath, airconditioning, hairdryer, iron, radio, fridge, ironing facilities, flat-screen TV, DVD player, sofa, eletric kettle. Room includes: 1x queen sized bed & 1 set of single bunks, air conditioning, balcony, ergonomic desk chair, LCD flat panel TV, non-smoking, hairdryer, internet access, iron, ironing board, mini bar and rubber shower mats. On booking the hotel will charge a deposit equal to one nights’ accommodation. Fourteen days prior to arrival the hotel will charge the balance of the total accommodation booked. Cancellations within 48-hours prior to arrival, will be charged one nights’ accommodation fee. Cancellation less than 48-hours prior to arrival, including no shows, will incur a 100% cancellation fee of the accommodation booked. Desert Palms is a 3.5-star property offering individual studio villa accommodation, surrounded by tropical gardens and set around a crystal-clear swimming pool with island and waterfall. Free Wi-Fi is accessible throughout the property. 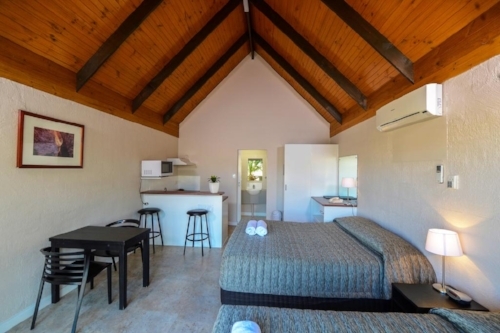 All villas at Desert Palms Alice Springs are air-conditioned and include bougainvillea-covered verandas, private ensuite bathrooms and kitchenette facilities. There is a small kiosk and shop on-site, where food items and liquor can be purchased. Facilities include a guest laundry, BBQ area and secure off-street parking directly outside each villa. Room includes: 1x queen size bed & 1x single bed, air-conditioning, bar fridge, kitchenette, linen & towels, microwave, hotplate, ensuite, toaster, tea & coffee making facilities, free Wi-Fi. Room includes: 1x queen size bed & 2x single beds, air-conditioning, bar fridge, kitchenette, linen & towels, microwave, hotplate, ensuite, toaster, tea & coffee making facilities, free Wi-Fi. Room includes: 1x queen size bed, 1x single beds and 1 bunk bed, air-conditioning, bar fridge, kitchenette, linen & towels, microwave, hotplate, ensuite, toaster, tea & coffee making facilities, free Wi-Fi. Twenty-one days prior to arrival the hotel will charge a deposit equal to one nights’ accommodation. Fourteen days prior to arrival the hotel will charge the balance of the total accommodation booked. All cancellations received within 48-hours of check in will be charged at 100% of the accommodation booked.